To optimise your asset, you could use Proxy Geometry Tool? The dynamic water system on land is programmed as a blueprint. FD_Surfacewater contains both the logic and the assets of the water system. The backbone of the FD_Surfacewater is a spline with points. The points represent a change in the water system, for example: input discharge, different structure (pipe, channel, weir..), different dimension. So each point (=Node) is connected with the database WaterSystemData. So in between 2 points (=branch) of the backbone spline, everything is the same, based on the information of the downstream point.. Spline and point represent the bedlevel of the structure. Al the programming is done in the so called construction script. This is a cool feature of Unreal Engine. Al programmed calculations can be done in the editor. It is for example not necessary to run the game, to see what waterlevels will occur. They are already calculated in the editor. The basis of the watersystem is a spline. Between 2 nodes the structure is the same. The location of the spline is the bedlevel. A FD_Surfacewater is one line with no branches and has a fixed direction of flow. A dendritic system is possible, because the 3D world may contain different FD_Surfacewater which are connected at points. When calculation a dendritic system the sequence of making calculations is important. Strategy for calculating the water-system.We assume a stationary flow. So new calculations are only made when changes are made to the water-system. In the future calculations will be made per time-step and change in storage will also be taken into account. To get access to the information, or to change information menu are used. Backbone of FD_Surfacewater is the WaterDataStruct which stores all data (also calculated data) for each branch. 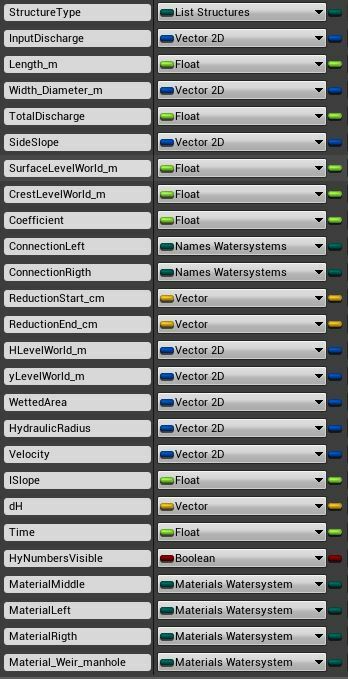 In FD_GameMode: FD_WaterSystemsref and FD_WatersystemName. Note This does not work in constructionscript ? So it should be a separate function in the constructionscript. Is not a separate branch, but is generated when 2 culvert pipes branches connect. The check on manhole is made when type is culvert. If type_down also is a culvert, a manhole can be added. When diameter pipes is the same, the following switch is used. A Boolean variable Manhole is defined. Manhole is always a rectangle, with max 4 pipes connected. So 2 other BP_watersytems could be connected to the manhole. In de first version, side connections is not taken into account. Information from the array is also necessary for the Reduction Length for ending and starting pipe. I find the most difficult. Albedo is the characteristic color of an object. More precisely, it is the bi-hemispherical reflectance of a surface. It is view independent and is more commonly named diffuse. Diffusion = Out of the material ( Diffuse Light”, “Diffusion”, “Subsurface Scattering” ) . The absorption and scattering of diffuse light are often quite different for different wavelengths of light, which is what gives objects their color (e.g. if an object absorbs most light but scatters blue, it will appear blue). The scattering is often so uniformly chaotic that it can be said to appear the same from all directions – quite different from the case of a mirror! Translucency & Transparency = different diffuse colour at different depth material? Skin for example. Energy Conservation : reflection and diffusion are mutually exclusive. Firstly, they tend to be much more reflective than insulators (non-conductors). Conductors will usually exhibit reflectivities as high as 60-90%, whereas insulators are generally much lower, in the 0-20% range. These high reflectivities prevent most light from reaching the interior and scattering, giving metals a very “shiny” look. Secondly, reflectivity on conductors will sometimes vary across the visible spectrum, which means that their reflections appear tinted. This coloring of reflection is rare even among conductors, but it does occur in some everyday materials (e.g. gold, copper, and brass). Insulators as a general rule do not exhibit this effect, and their reflections are uncolored. Finally, electrical conductors will usually absorb rather than scatter any light that penetrates the surface. This means that in theory conductors will not show any evidence of diffuse light. In practice however there are often oxides or other residues on the surface of a metal that will scatter some small amounts of light. Fresnel: refers to differing reflectivity that occurs at different angles. Specifically, light that lands on a surface at a grazing angle will be much more likely to reflect than that which hits a surface dead-on. This means that objects rendered with a proper Fresnel effect will appear to have brighter reflections near the edges. The first is that for all materials, reflectivity becomes total for grazing angles – the “edges” viewed on any smooth object should act as perfect (uncolored) mirrors, no matter the material. Yes, really – any substance can act as a perfect mirror if it is smooth and viewed at the right angle! This can be counterintuitive, but the physics are clear. This measure is often referred to as “Gloss”, “Smoothness”, or “Roughness”. Microsurface properties have other subtle effects on reflection as well. For example, the “edges-are-brighter” Fresnel effect diminishes somewhat with rougher surfaces (the chaotic nature of a rough surface ‘scatters’ the Fresnel effect, preventing the viewer from being able to clearly resolve it). Further, large or concave microsurface features can “trap” light – causing it to reflect against the surface multiple times, increasing absorption and reducing brightness. Different rendering systems handle these details in different ways and to different extents, but the broad trend of rougher surfaces appearing dimmer is the same. So formulas of Manning, Chezy and Darcy-Weisbach can be used. So calculations of water-levels start downstream and goes upstream. At weirs super-critical flow may occur. Discharge is not changing rapidly. Of-course over time discharge (and thus water-levels etc) can change. There are two main watersystems. The watersystem on the island and the sea (waves, tide, current). The connection between the two are by the culvert in the dike and seepage. High tide in combination with low water level on the island could make water flow from sea to the island. High tide can cause seepage to the land, low tide seepage to sea. Maybe in high tide in combination with big waves can cause water flowing over the dike to the island. Water enters the systeem by: rainfall and seepage. Water leaves the island through : Culvert in dike, pumping station, seepage and evapotranspiration. So water has one direction to flow. For each branch waterlevel (ylevel) and Energylevel (Hlevel) are calculated at the beginning (.x) and end (.y) of the branch. This info is stored in WatersystemData. Hlevel.x = Hlevel.y downstream branch. Weir is an exception. Hlevel.x is calculated based on the crestlevel. Over the length of a branch, the basic dimensions are the same, only the surfacelevel at x and y may differ. Exception is the connector, you have different width and slope downstream and upstream!! 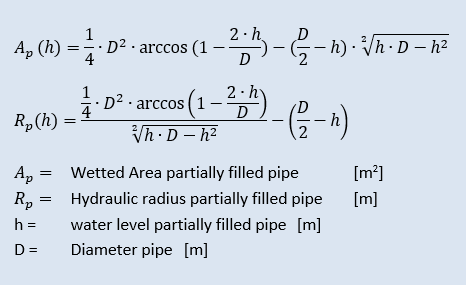 CulvertRectangle: If downstreams waterdepth < Height culvert : Type is converted to Trapezium. Note: With high velocities, water level will rise and the type maybe should be concerted back to culvertrectangle. This can be solved by splitting het culvert in several branches. In a branch (between 2 points) discharge is always the same. 2 special branches when calculating. First is the outflow: Discharge = 0. Value in InputDischarge.x is the velocity in the receiving water. Second is the weir : There is a jump in HlevelWorld compared to the downstream waterlevel. Weir is always assumed as free flow. And as a short crest. Waterlevel .x and .y are the same. Based on ylevel.x. Slope Hline is calculated. Hlevel.y is calculated. Check if branch is weir. If weir calculate H above weir, convert to HlevelWorld_m.x = HlevelWorld.y. yLevelWorld_m = CrestlevelLevelWorld_m + 2/3 * H.
dH.x and dH.z are based on the type of the adjacent branch. dH.x and dH.z is not yet calculated with Rectangle Culvert.